Happy September, friends! First, can we even believe it’s September?? I cannot. Call me a cliche, but I’m firmly in the this-summer-flew-by camp. I feel like I still need a few good days of dipping myself in the lake, eating drippy ice cream cones and toasting marshmallows for s’mores over a bonfire before I can say bon voyage to this sunny season. That being said, I also do love me some autumn. Chunky sweaters, cozy scarves, colored leaves, pumpkin spice lattes, crisp air… oh man, it’s so good. But I can wait at least another month or so before fully embracing that situation. 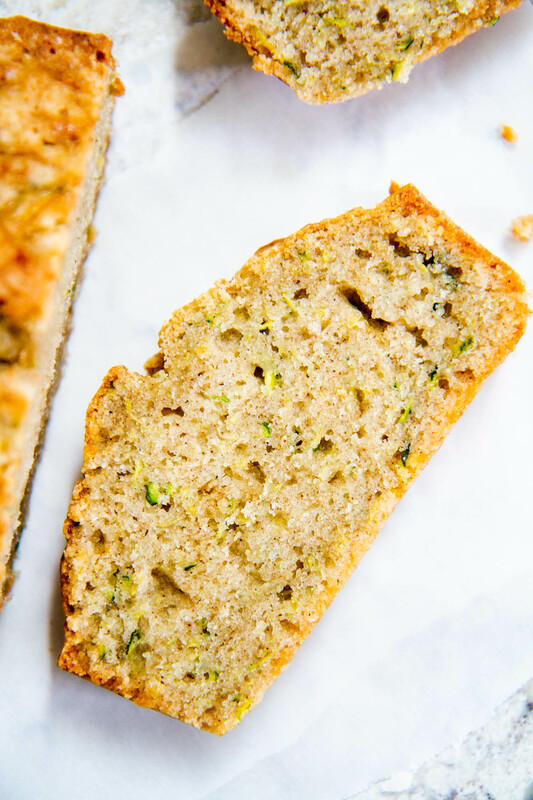 That’s partially why I’m bringing to you today my Mom’s zucchini bread — because to me, this bread is the perfect bridge between summer and fall. It utilizes one of summer’s most prolific crops, but it’s baked into a soft, moist, dense, spice-laden loaf that goes perfectly well with cooler temperatures and warm drinks. It’s one of the most quintessential recipes of my childhood, and I’m amazed it’s taken me this long to bring it to your face. We’ve spent the last week at my parents’ house in southern Wisconsin — well, the girls and I have. My husband, dad and brothers are on their annual fishing trip to northern Wisconsin, so my mom and I have been tasked to hold down the fort while they’re gone. It’s been great, actually — despite the fact that it’s rained almost every day, we swam in the lake behind their house, took a nature hike, made a treasure hunt, watched movies, danced and baked up a bunch of goodies, including this yummy zucchini bread. It’s been a good week, and I doubt any of this bread will be left by the time the men come home. Sorry not sorry! 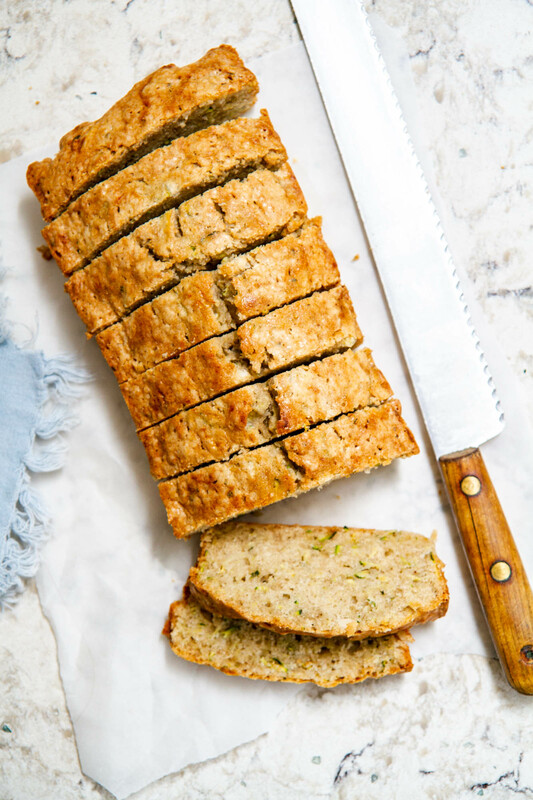 The basics of this quick bread are simple: Flour + oil + eggs + sugar + spices + shredded fresh zucchini = a double-batch of one seriously delicious loaf. But beyond that, this recipe is one of those recipes that has endured and will continue to do so in our family for years to come. 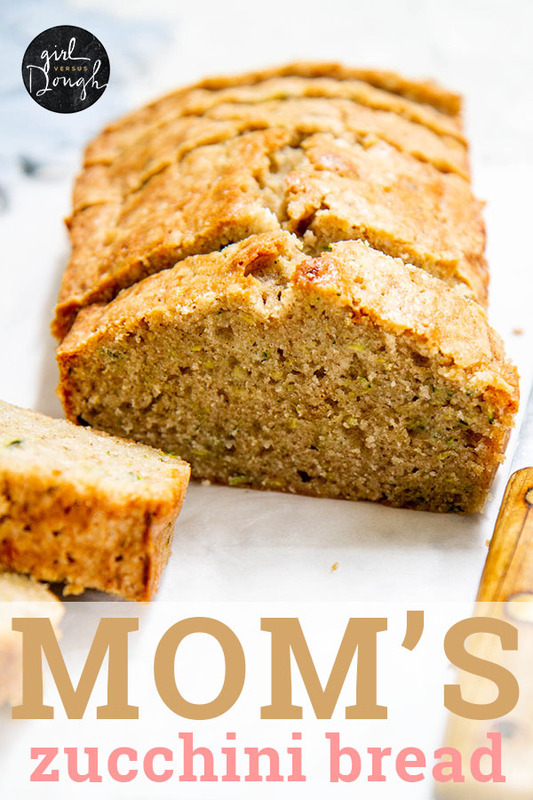 I remember walking into my house as a kid and immediately recognizing the smell of fresh-baked zucchini bread when my mom decided to make it, and it was the best thing ever. To this day, I wish I could bottle up that smell or turn it into a candle. Until then, I’ll just have to bake Mom’s zucchini bread all. the. time (which is no problem at all). 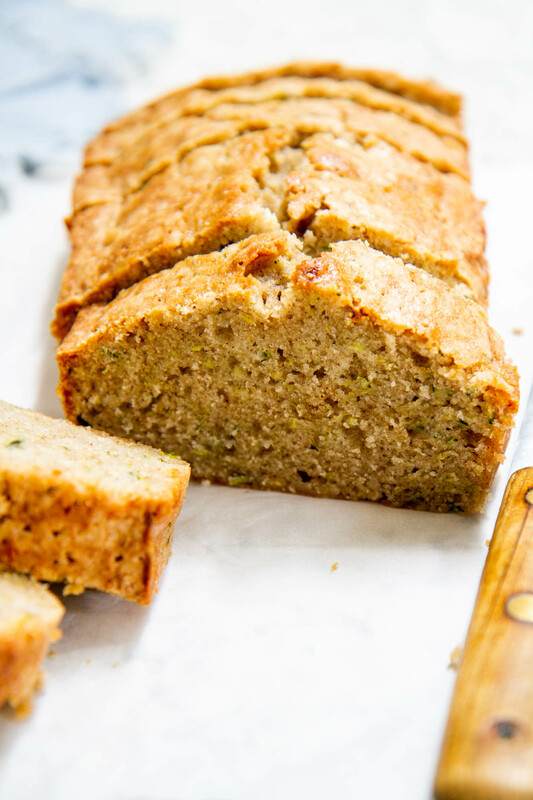 So if you’re like me and, a) aren’t ready for summer to be over, but also excited for fall times, b) love zucchini bread and c) also love to eat tasty foods, then I highly recommend making this recipe as soon as possible. It could even become a traditional recipe in your own family! Which would make me the happiest. Also, invite me over when you make it, even if only for the smells. P.S. Also check out my Mom’s Egg Salad, Mom’s Baked Bean Casserole and Mom’s Classic Heirloom Tomato Spaghetti Sauce. Because mom recipes are the best. Heat oven to 350 degrees F. Grease two 9×5-inch loaf pans with cooking spray. In a large bowl, whisk sugar, oil, eggs and vanilla until smooth. In a medium bowl, whisk flour, cinnamon, baking powder, baking soda and nutmeg until well blended. 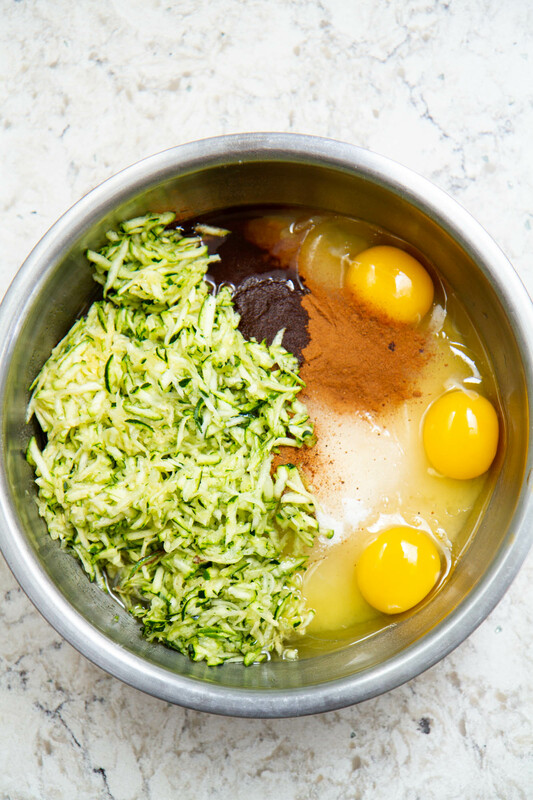 Add dry ingredients to wet ingredients; stir until just combined. Stir in zucchini. Divide batter evenly between loaf pans. Bake 1 hour to 1 hour 15 minutes until toothpick inserted in center comes out clean. Cool in pan 15 minutes; remove from pan. Cool completely on cooling rack before slicing. This is almost identical to my mother in law’s recipe and it is an excellent loaf indeed. she adds a cup of chopped nuts (walnuts work well) and you are missing 1 teaspoon of salt. Love that this recipe passes through generations! My mom never adds salt and we never notice it missing, but I might add a pinch next time. 😉 Thanks for your comment! YUM!! I am still in peach a mood. HA!! LOVE peaches. I would like a good apple cinnamon muffin anytime. We have apple festivals this month. No pumpkin recipes until late Oct. or early Nov. for me.